As a Certified Florida Supreme Court Mediator, Jill Schwartz provides mediation services for all types of civil litigation, including employment law matters. She is also certified by the Fifth District Court of Appeal as an appellate mediator. Additionally, Ms. Schwartz was selected by the EEOC and the U.S. Postal Service to mediate employment matters for these agencies. Ms. Schwartz has continued to attend and conduct seminars on alternative dispute resolution. Ms. Schwartz mediates litigation pending in the United States District Courts and Florida State Courts. She also conducts pre-suit mediation. 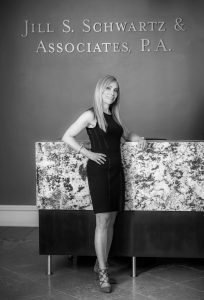 Ms. Schwartz is a qualified arbitrator and has served as an instructor for the Supreme Court of Florida Dispute Resolution Center, Arbitration Certification Training and the Florida Bar. Our offices are conveniently located in Winter Park, Florida and provide ample parking and a comfortable, spacious atmosphere in which to conduct mediations.